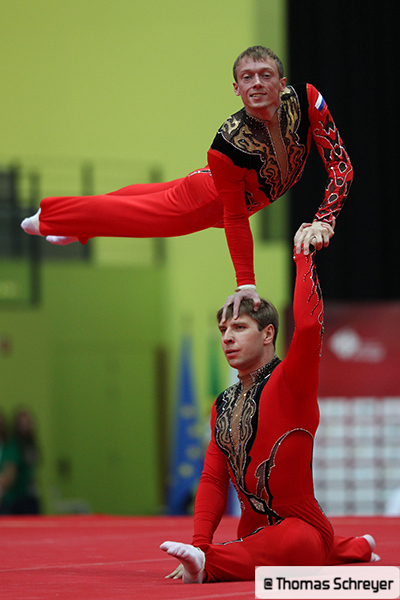 Acrobatic Gymnastics, whose origins go back to Antiquity, was first developed in the 1950s in Eastern Europe. At that time, the Soviet Union, Poland, East Germany and Bulgaria were the countries leading the way in the discipline. As time went by, events between these countries were organised and the discipline began to increase in popularity. This led to the creation, in 1973, of the International Federation of Sports Acrobatics (IFSA), which covered Sports Acrobatics (the former name for Acrobatic Gymnastics) and Tumbling. The first World Championships were held in Moscow one year later. In 1985, the discipline was recognised by the International Olympic Committee, and in 1993 it was included in the programme for the World Games in The Hague (Netherlands). Five years later, when trampolining was included in the Olympic Games, the IFSA and the FIT (Fédération Internationale de Trampoline; International trampoline federation) merged with the International Gymnastics Federation (Fédération Internationale de Gymnastique). In 2005, Sports Acrobatics changed its name to Acrobatic Gymnastics, with the aim of standardising all gymnastic discipline designations. Today, Europe is still the nurturing ground for the discipline, but the magic of Acrobatic Gymnastics has reached every continent. It is now practised around the world and particularly in France where it appeared at the end of the 1970s.To promote this emerging discipline, France organised the first World Championships in 1986, and one year later the first French National Championships in Evry. In 1994, and until 2005, the discipline was recognised as a high-level sport by the French Ministry of Youth and Sports. There are currently 2,000 athletes who practise the discipline in France.